If your dog is squinting one of his eyes, any number of different diseases and injuries could be the culprit. Uveitis in dogs is a common diagnosis. Let’s learn more about this condition and what it means for dogs. First, what is uveitis in dogs? 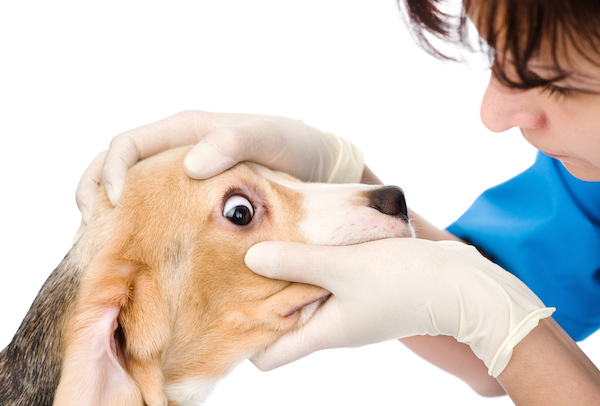 First, what exactly is uveitis in dogs? Photography by Ermolaev Alexander / Shutterstock. The term uveitis is a descriptive term — it just means inflammation of the eye. Uveitis is not a disease itself. Inflammation of the eye is caused by some other underlying issue, and your veterinarian will have to do some detective work to get to the root of the problem. “Common causes of uveitis include infectious diseases (such as viruses, bacteria, fungal organisms, protozoa and parasites), trauma to the eye, damage to the lens, corneal ulcers, immune-mediated disease and intraocular tumors,” says Stephanie Beaumont, DVM, Dipl. ACVO, a board-certified veterinary Ophthalmologist at Animal Eye Specialists in Richardson, Texas. What are the symptoms of uveitis in dogs? In addition to holding the affected eye closed, as mentioned above, you might also notice excessive tearing, eye redness or cloudiness, changes to the appearance of the iris (the colored part of the eye), light sensitivity, and possible rubbing or pawing at the eye. What should you do if you suspect your dog has uveitis? Because so many different problems may cause symptoms of uveitis in dogs, have your dog examined by a veterinarian as soon as you first notice symptoms. With many eye issues, letting them go without treatment might lead to serious damage to the eye and even permanent loss of vision. Additionally, most eye disorders are very painful and you don’t want your dog to suffer needlessly. If you see your dog squinting or holding his eye shut, or notice redness or tearing, make a vet appointment within 24 hours. How is uveitis in dogs diagnosed? How is uveitis in dogs treated? To help diagnose the underlying problem and cause of the uveitis, your vet might want to run some general bloodwork or more specific bloodwork if she suspects infectious causes, or even do an ocular ultrasound. Additionally, anti-inflammatory eye drops or ointments can reduce the eye inflammation and pain medications will keep your dog comfortable. Once the underlying cause of the inflammation is identified, further treatments might be in order. If the veterinarian can’t determine the cause of the uveitis, she might refer you to a veterinary eye specialist (a board-certified veterinary ophthalmologist). A little eye squinting or tearing might not seem urgent, but the eye is a delicate organ that can become badly damaged fast. For that reason, it bears repeating that it’s never a good idea to put off seeking veterinary treatment. “If the uveitis is not controlled, it can result in intraocular scarring and other vision-threatening complications, such as retinal detachment and glaucoma (elevated intraocular pressure), both of which can result in blindness,” Dr. Beaumont says. The post What Is Uveitis in Dogs? Symptoms, Treatments and More appeared first on Dogster.